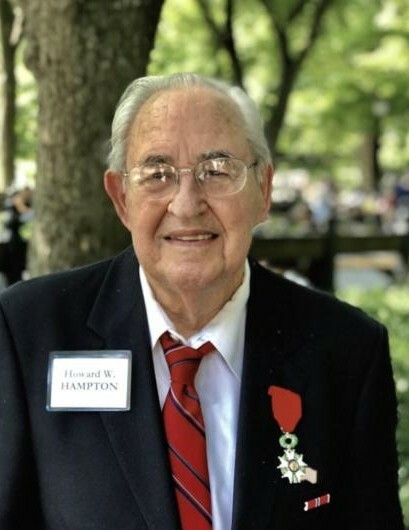 Mr. Howard W. Hampton, Jr., 94, died peacefully on January 18, 2019, surrounded by loving family in Lake Wylie, SC. Howard was born on November 25, 1924 to Howard Sr and Marion (Schwarter) Hampton in Atlantic City, New Jersey. He was the oldest of 2 children. He graduated from Germantown High School in 1941. Howard after graduating high School enlisted in the U.S. Navy and served with distinction as a Pharmacist Mate C3 with the 6th Naval Beach Battalion both in Europe and the Pacific. The 6th Naval Beach Battalion hit the beaches of Normandy during the early morning hours on D-Day, 6 June 1944. For his service, Howard was awarded the Bronze Star, the Combat Medical Badge and the French Legion of Honour, France’s highest military award. Howard was introduced to beloved wife of 71 years, Lillian C. Starn by his uncle and they married on May 24th, 1947. He began a career shortly after in Lillian’s family’s business “Starn Shoprite”. He managed both the Absecon and Somers Point, New Jersey stores. He retired in 1982. Howard loved to spend time with family and friends. He was actively involved in Skiing, Golf, boating, fishing and his church, Central United Methodist of Linwood, NJ. Howard is survived by his wife, Lillian, daughters, Pamela Manley and Linda (Brian) Cruse, 4 Grandchildren Justin, Jacqueline, Kristin and John and 10 Great Grandchildren, Alexa, Jared, Gabe, Jacob, Cameron, Riley, Matthew, Evelyn, Lilly and Henry. Howard was predeceased by his parents, his brother Robert Hampton along with son-in-law Alan Manley (Pamela) and grandson through marriage John Zinn (Jacqueline).